This is part 3 of a week-long travelogue. Previously: Sana’a, Green Arabia. The coffee houses of Ibb and Jiblah are full of soldiery, despite instructions to the contrary from Sinan to their commander. A poisoned quince is served to an allegedly drunken commander in the castle of Habb and a cat with a fused explosive attached to its tail is used to blow up the castle gunpowder storea. I wake up to a gorgeous morning in Ibb. This time I’ve slept through the morning call to prayer and the sun is well up in the sky. Out the window there’s a view of a regular city against a backdrop of green mountains, with some construction equipment in the near foreground, and it takes my groggy mind a minute to piece together just exactly where I am, and feel the little rush of anxiety that stands me in stead of my morning coffee. The tourist hotels in Yemen all share a certain look, like they were decorated in tacky splendor by the same person in 1971 and have not been touched since. The rooms are tidy, threadbare, but not particularly clean. The furniture and carpets in the common spaces are so elderly I feel bad walking on them. The elevators work, but have been turned off to avoid stranding peple during the frequent power outages. What few visitors there are take the stairs. Ali the driver meets me in the lobby and takes me to eat breakfast in the restaurant next door. At this hour there’s almost no one there, just us and pair of young men with the Salafist neckbeard that signifies the devout. Breakfast is a delicious dish of mashed fava beans scooped up with broad disks of bread, with sweet hot tea to wash it down. Breakfast tastes especially good after chewing qat the night before, since the leaves suppress appetite and tend to make you skip dinner. The little restaurant is full of sunlight and I could not be in a better mood. Today we are on our way to Ta’izz, Yemen’s third-largest city. Ta’izz is an interesting middle ground—it’s still in the temperate highlands, but far from the capital and close to the major ports of Aden and Mocha. Ta’izz also has a healthy distrust of the northern hill tribes who periodically descend from the north of the country and cause chaos (as they’re doing now, a year after my trip). Ali lays out the day’s itinerary: two mosques, a mountaintop, a castle, and a souq. The drive out of the city gives me a chance to reflect a little on Yemeni driving. Traffic safety is the responsibility of a large ‘masha’allah’ sticker affixed to every car’s rear windshield, the Muslim equivalent of a medal of St. Christopher. With the sticker in place, a driver can be confident that he’s done everything humanly possible to prevent accidents, and no further measures (such as not passing on blind mountain curves) are necessary. They might even be an affront to God. The accident rate is high (about fifty times the per-vehicle rate in America) but nowhere what you’d expect given that everyone is driving at all times like a maniac. Intersections resemble those fancy computer simulations of what a world would look like with automated cars, if those cars were also programmed to kill. Two streams of traffic somehow interpenetrate without slowing down. On multi-lane roads it’s accepted for cars to use the far right lane to travel in the reverse direction if making a U-turn is too inconvenient. And yet the roads are not full of smoldering wreckage. American drivers treat the car horn like a button marked EMERGENCY, to be used only at times of imminent danger or great injustice. A non-Bostonian can drive for weeks without touching the horn. 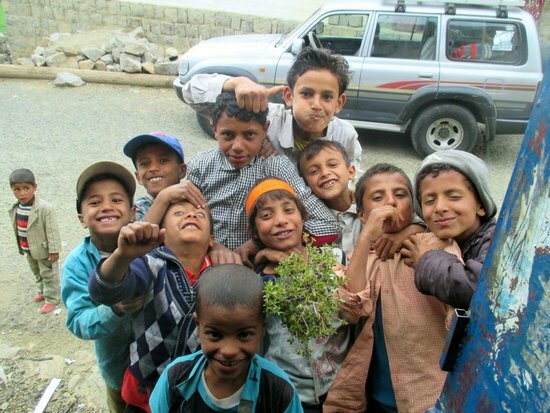 If you disabled the car horns in Yemen, there would be an immediate nationwide car wreck. 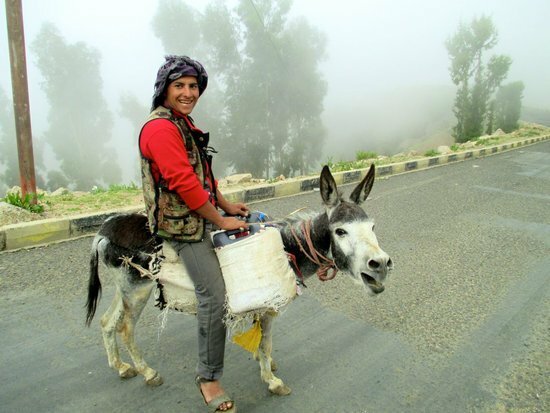 The horn is an essential part of Yemeni driving, and in skilled hands becomes an instrument of great subtlety. It can mean “I’m coming up behind you”, or “I’m about to turn left across five lanes of traffic”, or “I’m passing on this blind curve on a mountain road while digging with both my hands in a bag full of qat.” Drivers use it to communicate their intentions to the three-year-olds playing unsupervised in the street, and even to dogs and pack animals. Everyone speaks car horn. Ali is a virtuoso on the car horn; driving with him is like sitting in on a session with Charlie Parker. In an ominous bit of foreshadowing, we pass another couple of gas stations where the lines seem to have grown even longer overnight. I have yet to see anybody at a gas station dispensing fuel. The drivers just sit forlornly by their vehicles, waiting. When we reach the open road Ali cranks up the tunes, in this case a beautiful Quranic recital. We’re back in the same landscape of rock cliffs and impossibly green valleys as yesterday, still heading south along the main Sana’a—Aden road. We turn off after a few miles to visit the oldest mosque in Yemen, al-Janad, built while Mohammed was still alive. The rule of thumb with mosques is the older the simpler. This mosque is a large open courtyard surrounded an arcade of thick white columns, with a simple minaret at one end. No one is at the entrance, but we can hear the sound of classes taking place inside. 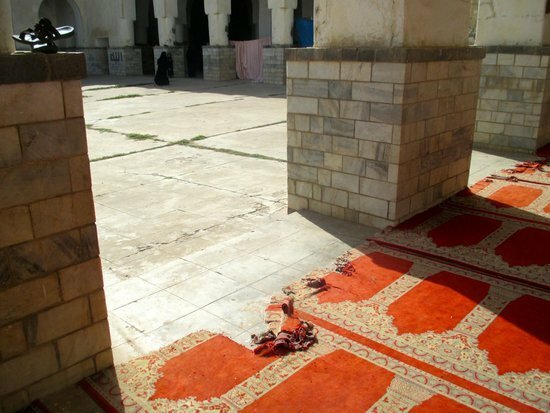 Ali takes me through the courtyard and along the carpet-lined arcades along the perimeter. In every corner there is a little group of boys or girls sitting on the carpet facing a blackboard, listening to their teacher (a young man for the boys, a fully veiled woman for the girls) presenting the day’s lesson. The boys smile or stare when they see me. Many of the girls turn away, especially the older ones, lifting the corners of their headscarves to hide their faces. I do my best to play my part, nodding and taking photos like the distinguished foreign guest that I aspire to be. We almost manage a full circuit of the mosque before the imam intercepts me. He is a wiry, elderly man dressed in white, and when he speaks (which he does almost without interruption) I see that many of his teeth are missing. The imam is a charismatic fellow with an air of immense authority and strong views about how the mosque should be visited, all of which I have flouted. We need to go back to the courtyard gate and start over again. He has me wash my hands in the ritual fountain, points out the several ancient stone carvings of Quoranic quotations inset into some of the columns, and turns my attention to the minaret (the oldest part of the structure) until I have photographed it to his satisfaction. As we pass by the groups of schoolchildren again, he claps his hands and summons them to rise and recite with him. It is clear from the way the children react that they are full of affection and respect for this tiny man. We make a full loop, wreaking havoc on lesson plans, and finally circle back to the courtyard so the imam can get a shot of me standing in front of the minaret. I would give anything to be able to take his picture as he prepares to take mine. Two veiled teenage girls in black giggle over his shoulder while he inspects the camera. Settling on a low angle, he crouches down like a seasoned photographer to capture the shot. Next he pulls me outside the courtyard and takes me around the building from the outside, pointing out little windows I should peer through to see the tombs of particularly illustrious figures from the mosque’s past. The mosque is rather pitiful on the inside, with detached chandeliers laying on chairs, headless water coolers, peeling plaster and artlessly strung wiring. But he is not satisfied until I have taken a photo of the darkened interior through each dirty window. Our last stop on this surreal circuit is the Ottoman baths, built about a thousand years after the mosque by troops during one of the Turkish occupations of Yemen. As I’ve mentioned before, the Ottoman garrisons’ experience in Yemen was essentially one of non-stop terror, so the bathhouses served a practical function. Time has reduced them to a row of stone cells in a trench that’s filling up with trash. The imam draws my attention to a conduit that used to bring water all the way down from the mountains to our north. After a brief financial negotiation that the imam indicates with his finger is to remain between me, him, and the Most High, Ali materializes from wherever it is he goes in these situations and we continue our journey. As we turn back onto the main road, I see a gas station with the most formidable line of cars yet. It disturbs me that Ali has slowed down and started to mutter. My hopes have riding on the jerry cans tied to our roof, which I hoped contained enough gasoline for our entire three-hundred-mile circuit. But Ali is clearly determined to make a pit stop. We drive along the queue for a while, and when it becomes clear that there’s no end to it, Ali makes a U turn and drives back to the gas station entrance. There’s a shorter but still formidable queue stretching out in the other direction. These are the people who for whatever reason think they deserve prority access over the suckers in the main queue. The rival queues meet at a big metal gate that protects the fuel pumps themselves. Guarding the gate is an extroardinarily angry military officer in a red beret. He has a very large wooden staff in his hand and is hurling it, along with torrents of abuse, at any car that tries to approach him. Ali drinks in this scene for moment, drives the car right into the junction where the two queues zip together, and leaps out of the car to confront the swarm of drivers who have leapt out of their own cars to confront him. The military officer is madder than I’ve seen anyone. Arabs aren’t shy about showing emotion when they argue, but this guy has long passed the point of vehemence and is edging into homicidal fury. In any other country there would be a wide, clear space around him and somebody in authority speaking soothingly through a megaphone. The officer has a sidearm, but for the moment he’s using the wooden staff to express his feelings. One of the queue jumpers tries to sneak his car in behind him, but the officer catches on and turns around, smashing enormous dents into the hood. The car recoils like a dog that’s had its nose slapped, but the other cars behind him have already crept forward and there’s no way for the offender to back up. For an entire minute we watch the military guy obliterating a hapless Toyota before the line of cars can somehow all go into reverse at once and create enough room for the victim to escape. Ali gives me a “what are you gonna do?” shrug and attempts to engage the officer in conversation. Up to this point I had the fuel crisis filed in my head under ‘wacky Yemen’, and assumed having the military policing a gas station queue was just one of life’s little quirks here. But it’s beginning to dawn on me that nobody finds this normal. Ali tries to plead his case, but the officer is so mad he won’t have any of it. At one point I see him throw his beret down on the ground in disgust. Some lower ranking flunkie scurries over to retrieve it and place it back in his hand. He motions Ali away and resumes his attack on nearby vehicles. Defeated by the military, Ali tries the civilian chain of command. He finds his way to the gas station owner and starts to speak, gesturing several times back at our car. My attention is still on the berserk Army officer when Ali rushes back inside, quickly starts the motor, and drives into a gap that has miraculously appeared in front of the gate just long enough for us to slip in. The officer turns his full rage on us, but before he can mete out wooden justice the owner has interceded and opened the gate. He directs his anger instead on the cars and bikes that try to follow us through. An instant later we are in the much shorter, much happier queue of cars waiting to use the actual gas pumps. It’s still pandemonium here, but now it’s the joyful pandemonium of people who know they’re going to leave with a full tank. Boys run back and forth ferrying bottled water and messages, while the mechanical counters on the pumps spin and spin. One of the things I love about white privilege is how well it travels. I’m at a point in my journey before I have grown too much stubble, before I’ve accidentally crushed my sunglasses, and before we’ve descended to the Red Sea coast where I will sweat out my body weight in water every afternoon. I’m wearing slacks and a sweater that are still arguably clean. In a few days the fuel crisis will become so dire that these niceties would be ignored even if I didn’t look like I had just crawled out of the ocean. But for now, the ruse works and they fill our jerry cans with sweet, sweet fuel. Ta’izz is a vast city that fills an entire valley. We disembark into a tired-looking hotel that is a spiritual cousin to the place in Ibb, and I use the few minutes before the power goes out to charge my camera battery. Our next stop is the Al-Ashrafiya Mosque. The inside of this mosque is covered in murals from Ottoman times, and UNESCO has poured serious money into restoring it. The king’s tomb is sumptuous, and I’m allowed to poke my head inside to look at the incredible decorative patterns covering the ceiling. Outside I meet the Italian team who doing the restoration, a grandfatherly man and two women in their thirties, taking their lunch break. I catch myself staring at them because their faces aren’t covered and I can see their hair. It’s only been three days and already Yemen is making me creepy. The Italians don’t speak much English, so all I can do is praise their meticulous work and wish them good luck. 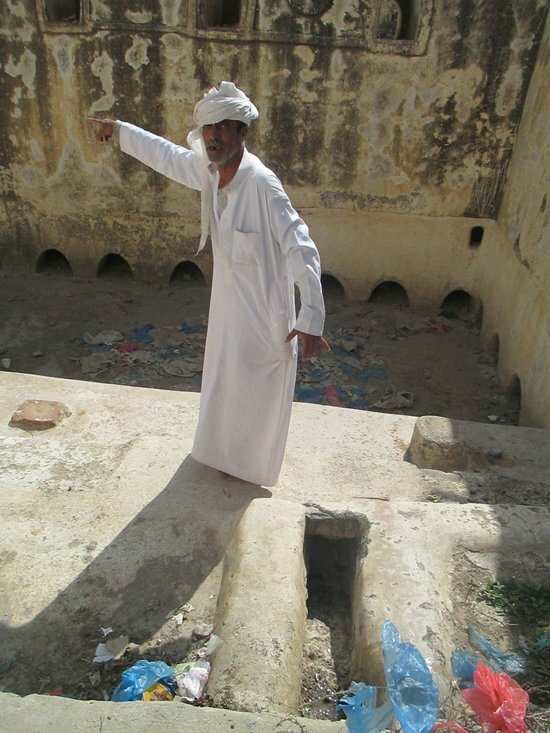 My guide takes me outside to a huge trench of garbage, full of red and blue plastic bags that qat is sold in, to talk to me about the many financial challenges facing mosque guides in the present difficult tourist climate. Ali asks me if I want to eat in a fancier restaurant or a ‘people’s restaurant’, like we did yesterday. With four Yemeni meals under my belt, I feel like an old hand. Of course I want to eat with the people! One thing I particularly like about eating in Yemen is that you’re expected to arm yourself with bread and condiments right outside the restaurant. A vendor has set up a little cart piled with vegetables, and he’s using a meat grinder to mince tomatoes, peppers and yogurt into a delicious mayonnaise-like spread. We buy a bowl of this along with two disks of hot bread. After we’re seated, young boys bring by a variety of additional ways to upradge the meal. One kid offers us an appealing bunch of leafy greens, and against my better judgement I buy it. The epic invasion of Yemeni microflora that ensues will live in the memory of my gut bacteria until my dying day, and make the next few weeks especially lively. 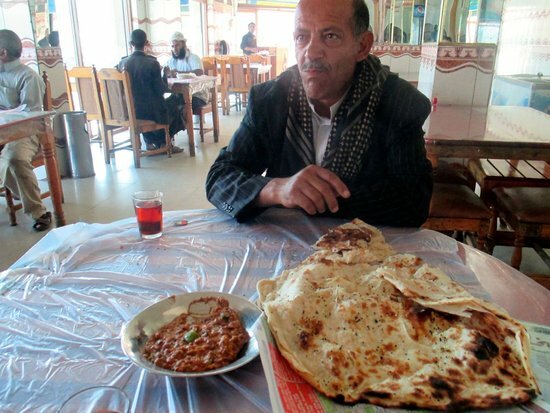 Yemeni dining is all business. There are no forks or small talk. You eat with your hands, wash the meal down with a hot fizzy Pepsi, scrub your hands with laundry detergent, then head back outside for a cup of tea in the sun. Today Ali takes me to a pushcart for dessert, where a stack of churro-like donuts soaked in syrup is served from within a cloud of patient bees. The experience feels a lot like playing blackjack at a casino. You make the ‘hit me’ gesture at the vendor, he lays down donuts one at a time until you signal that you've had enogh, and then he takes your money. Ali wedges me into a nearby tea stall so he can go buy qat. It is very bright and I feel sleepy and content, and at the same time extremely attentive. It‘s an odd feeling being possibly the only tourist in a city of half a million. I watch the bees circling the churro stand, and the crowd of men and boys buzzing in front of the restaurant watches me. After lunch we drive up an endless series of switchbacks up Jubal Sabir, the mountain that looms over Ta’izz from the south. The road offers vertiginous views of the city below. He points at one of the sumptuous villas we‘re passing. We pass a large tourist hotel on a striking promontory, commanding an excellent view of the city. My travel packet, a mass of text cut and pasted from a bygone era, says this is a nice place where we will be able to stop for tea and refreshments on the walk back down the hill. Ali tells me the hotel has just been shuttered. A few yards shy of the hotel we pass one of the ubiquitous Facebook billboards, showing a very un-Yemeni young man wearing a a fitted t-shirt. Facebook is offering free texting in Yemen as long as you use the Facebook messaging app. I can’t decide if the campaign is a cynical effort to boost Facebook’s growth numbers, a CIA-sponsored plot to capture more of Yemen’s SMS traffic, or a sign that some 25-year old marketing executive in Mountain View has gotten in way over their head. Possibly it’s all three. We zig and zag up a series of switchbacks until it feels like we couldn’t possibly ascend further. There’s a layer of overcast not far above the mountaintop that gives the drive a claustrophobic feeling, as if we are about to bump against the ceiling of the world. All of Ta’izz is now visible below us now, a vast urban agglomeration spilling along the basin. There are still shafts of sunlight coming through the cloud in places, creating an ethereal effect where they illuminate the city below. I can see a couple more of the Facebook billboards, easy to spot because of their distinctive blue color. Just as we reach the clouds, the road straightens, still climbing, and the vast city falls out of view. We pass terraced farms, orchards, small stone huts, and the occasional concrete garage built right onto the roadway. The walls along the roadside are covered with ominous black graffiti (on later inspection, it turns out to be advertising for hospitals and medical services). For some reason there’s a military checkpoint at the top of the mountain. A soldier with his cheek full of qat saunters out and lifts the semaphore for us, and we drive the last few hundred meters to the summit. The clouds are scudding past just overhead and I can hear what sounds like thunder. Ali tells me it’s not thunder but dynamite. People are blasting stone from nearby quarries that they’ll then shape by hand and use to repair the terraced fields and gardens. We stand for a minute admiring the view, then Ali says something I don’t quite catch about roads, points towards Ta’izz, and gets in the car and drives away. I’m left standing alone at the top of a mountain that is, on reflection, an awfully long way from my hotel. Sometimes I feel like I understand Ali well, while at other times—like right now—I am less satisfied with the quality of our communication. A group of small children is staring at me from a path below and I point at the various directions I can walk in until I see them nodding. This is the first chance I’ve had to be alone and outside since I got to Yemen, and I feel pretty excited and free. I realize Ali is not going to have any trouble finding me if he ever comes back. Meanwhile I’m determined to enjoy the rare chance to see a bit of this country without a guide. As I walk I get picked up by different phalanxes of children. They are very hierarchical; the oldest boys always boss the littler ones around. A man on a mule waves me down, delighted, and insists that take his photograph. Some of the children are just happy for the diversion, while others who have had experience with tourists cry out "Pen! Pen!" in Arabic, or "Gift!" in French, with their hands extended. It’s easy to distract them by asking the boys their ages and names. The mountain, I learn, is full of Mohammeds. There is a mist hanging over the fields that threatens to turn to rain. Just as the sky is really darkening I turn a bend and see Ali’s car parked in front of a store, nothing more than a concrete shelter with a metal door. Ali calls me inside and the proprietor hands me a can of fruit nectar while kids array themselves outside to see. The eldest son (Mohammed) asks for a pen, and I give it to him reflexively, thinking he’s going to write something down for me. Ali shakes his head and clucks as the kid examines his prize. Realizing my mistake, I take the good pen back and give him a cheap Bic instead. We leapfrog down the hill like this, Ali and I, for about an hour. I get to walk for half a mile or so, and then he rolls past me in the Land Cruiser and parks at the next switchback. I would feel bad for him if he didn’t have a big bag of qat, which is perfect for taking the boredom out of these kinds of situations. Ta’izz slowly creeps back into view. This question, normally kind of annoying, is simply farcical here. What am I supposed to say? That they have lovely eyes? That they sure know how to fill a niqab? That I find their fanatical modesty a huge turn-on? The only Yemeni woman I’ve been allowed to speak to so far was safely behind bars at the currency exchange, and even she had her hair covered. Every other woman I’ve seen, except for the very poorest beggars in the street, has been completely veiled. I mutter something about how all the people in Yemen are wonderful, how the world is wonderful, and wonderful it is to be in a wonderful country, and then slink away into the mist. Ali catches me on the next bend down. Enough walking. Let’s go to the castle. Cairo castle is a pretty, imposing fortification much closer to the city but on an even steeper spire. It’s another of those places that would be a tourist beehive in any other country. The views are spectacular. 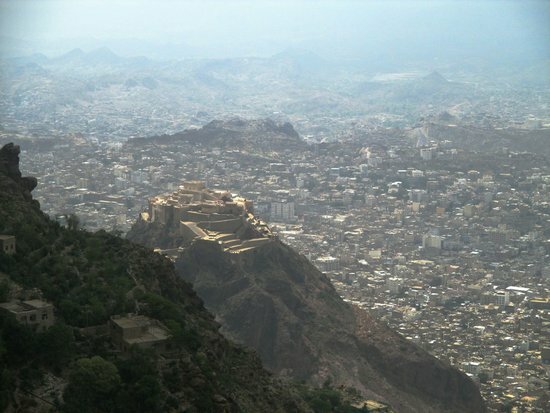 Like so many Ottoman structures in Yemen, it projects both the majesty of the Turkish empire, and the incredible level of dread motivating the conscript garrisons to build their giant fortresses in the most inaccessible high places. It’s not clear whether the Ottomans built Cairo castle from scratch or just expanded an existing structure, but they certainly spent a lot of time hiding in it. And here again we run into the military. They’re occupying the castle and won’t let us in without a bribe, so we content ourselves with a walk around the walls. Somehow the castle has been recently and competently restored; there’s even a kind of outdoor ampitheater being built nearby, occupied for the moment by a herd of grazing goats. Once more I’m struck by the care that people with almost no resources have put into maintaining and tending their archeological treasures. We finish the day with a nighttime visit to the old souq. The stalls are lit up by light bulbs, and as we walk the power goes out, leaving the narrow streets completely dark except for the few stalls that have a working generator. I can hear murmurs from every direction as the merchants laugh and chat together in the dark. Ali guides me down dark alleys in the eerie half-silence. The power flickers back on. At last he turns and asks, "what do you want here?". Taizz is famous for its cheese and its silver; I opt for the silver. In the shop I sip on cardamom tea while the proprietor calmly lays out hundreds of lovely necklaces. Many have big chunks of coral and yellow amber that look oddly opaque, almost like plastic. There is no obligation to buy anything, the seller explains, draping item after item over my extended arms. A lot of this stuff is very old and pretty much all of it is the work of Yemeni Jews who don’t live here anymore. Jews have lived in Yemen since ancient times, and Yemeni Jews have a distinctive forms of worship, holy texts and even a liturgical language. At various times they were oppressed or tolerated by the Islamic majority, depending on who was in charge, but they always had a second-class status. Over time they settled into an arrangement where the Jews specialized in manufactured goods and silversmithing. When a Jewish bride got married, she got herself decked out in incredible finery. Yemeni Jewish brides were pioneers in bling. A lot of this stuff is on the walls now, available for sale. I pass over the overtly religious items (little silver cylinders for holding scripture) as too creepy, given that nearly all the Yemeni Jews emigrated to Israel in 1949 and 1950. It feels weird to traffic in religious ornaments in their absence. But I have no qualms with the more decorative stuff. At this point I rival a Yemeni bride in splendor as the owner has been quietly decorating me with his inventory. These are hard times for the silver shop, like every tourist place in Yemen. Sometimes I feel like I am at the apex of an inverted pyramid, trying to hold up the country's entire tourist industry. We narrow things down to a manageable final few candidates and get down to the haggling. I feel somewhat unenthusiastic about demanding a discount from seven bucks to five on a silver necklace, but paying the stated price without haggling would be unthinkable. After protracted negotiation I count out a small hill of Yemeni currency and the owner bitterly congratulates me on striking a bargain he would never had agreed to in less desperate times. I am as crafty as a Bedouin, as wily as a serpent, and his only request is that I not tell anyone how good a deal I struck tonight lest he become the laughingstock of the city. Then he undermines his words by throwing in a couple of pieces for free. I can already feel myself being pulled across the street to visit a coffee and cheese vendor who is a personal friend of the store owner, but a pleading glance at Ali saeves me. He guides me down the dark streets to the hotel, just in time for the final blackout, this one lasting until morning.